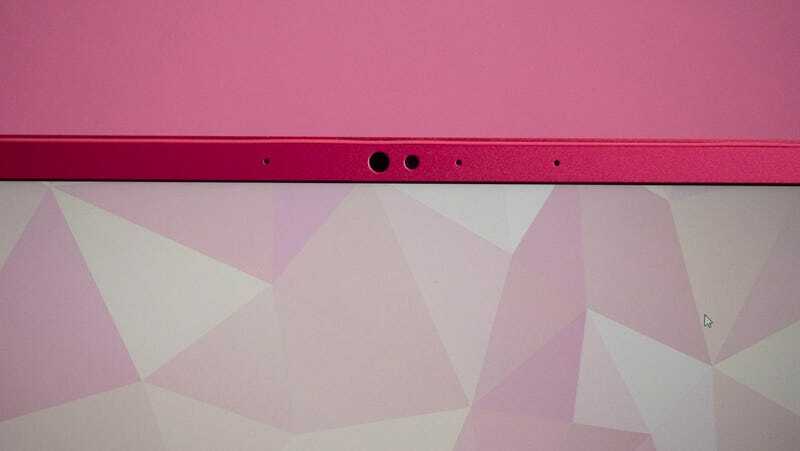 If you opt to go for the quartz version of the new Razer Blade Stealth, you may be distracted by the pink. 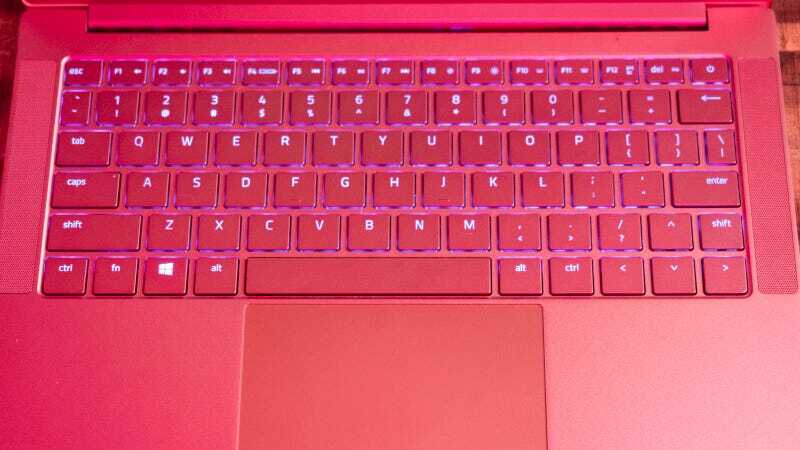 The keys, the trackpad, the bezels – hell, even the desktop is pink. Not “rose gold” like an Apple product, but pink like a Barbie box in the toy aisle. 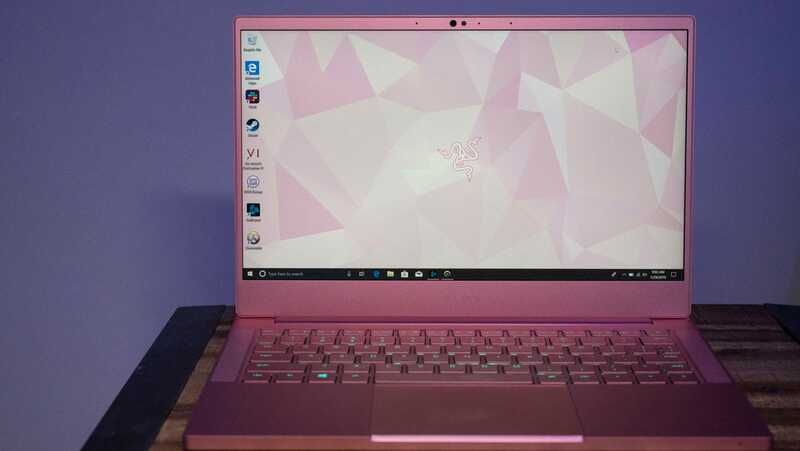 But do me a favour and look past the pink (the Stealth is also available in black) and focus on the rest of the redesign of Razer’s smallest laptop. Thanks to some smart aping from Dell, some serious power under the hood, and a uniquely Razer approach to the industrial design, the new Razer Blade Stealth is a compact wonder. Up to now, the Stealth has been a solid laptop: a little too expensive, not quite refined, and clearly inspired by Apple and Dell. Late last year Razer introduced a big redesign. 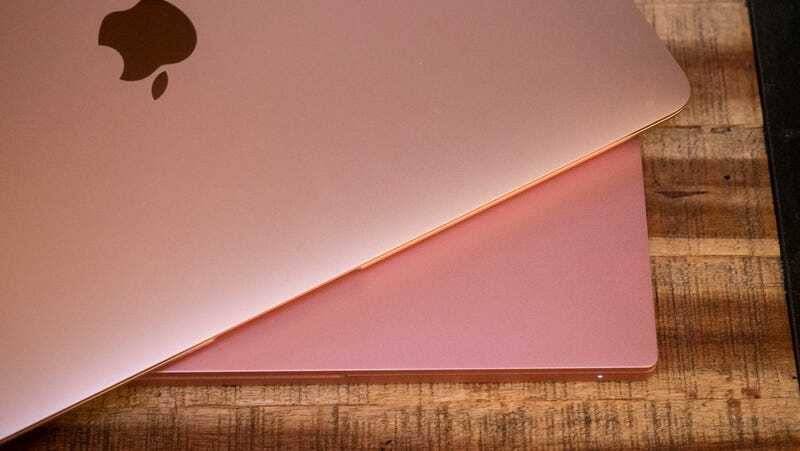 Now the 13-inch laptop has thinner bezels, like the ones Dell’s popularised, and hard edges, like the Razer Blade 15, or something from Microsoft. It’s also much pinker than Apple’s version of pink. The external redesign, and particularly the bezels, go a long way towards making this feel like a laptop worth its price tag. Dell’s XPS 13 has created a race amongst laptop makers – with everyone trying to shrink their bezels like Dell does. Smaller bezels means the same size display with a much smaller footprint. The Stealth is smaller than its predecessor and shares a footprint almost identical to that of the MacBook Pro. The keyboard is similar in size to smaller 13-inch laptops like the XPS 13 and MBP, too, but Razer’s keyboard has a customisable backlight with a claimed 16.8 million colours available and a wide variety of brightness levels, too. The keys are also some of the best I’ve used on a laptop. My high-water mark for a laptop continues to be the keys found on Lenovo’s ThinkPad X1 series, but the Stealth’s keys have a lower profile and are much quieter without sacrificing too much of the typing experience. The only downside to the keyboard is the right shift key, next to the up arrow button. If you’re used to the up arrow key on the bottom row and the shift on the second row, you can expect a day or two of annoying mistypes before you nail it down. It’s a minor complaint. The same goes for my issue with the display. Razer opted for a standard (and bright) 1080p display, but it feels about a year or two out of date next to the higher resolution displays Huawei and Apple are packing into similarly priced laptops. I doubt Razer will ever load the base Stealth with a 3,000 by 2,000 display like Huawei does because no games would support it, but man, it would be a bold move – maybe even bolder than an all pink laptop. The caveat with all Razer laptops is the price. It’s almost always too much, and the Stealth doesn’t change that, but it makes a more compelling case than previous Razer laptops. There are three ways to buy the new Stealth. It starts at £1,300 for an Intel 8th-gen i7 processor, 256GB SSD, and 8GB of RAM. Hopping up to £1,500 tacks on an additional 8GB of RAM and an Nvidia MX150 discrete GPU (this is the version we tested). Finally, for £1,800 you up the storage to 512GB and move from a matte 1080p display to a glossy 4K display. Razer squeezed not one, but two cameras, into the bezel, as well as a whole mess of microphones. The MX150 is well on its way to being two years old at this point, but it’s still really uncommon in slick 13-inch laptops. Lenovo and Asus make smaller laptops with this GPU, but they’re pretty lame looking. Only Huawei, and now Razer, seem to have any interest in putting the MX150 in an attractive laptop. Maybe more importantly, adding the GPU instantly adds power. Don’t expect to play Far Cry 5 at 60 frames per second, but Overwatch with graphics set to High still managed 57fps in our tests, and Civilization VI ran almost three times better on the Stealth as it did last year’s XPS 13. I spent the entire weekend playing Thronebreaker, which slows to a crawl when I play on an integrated GPU from Intel, but it played smoothly with the MX150. 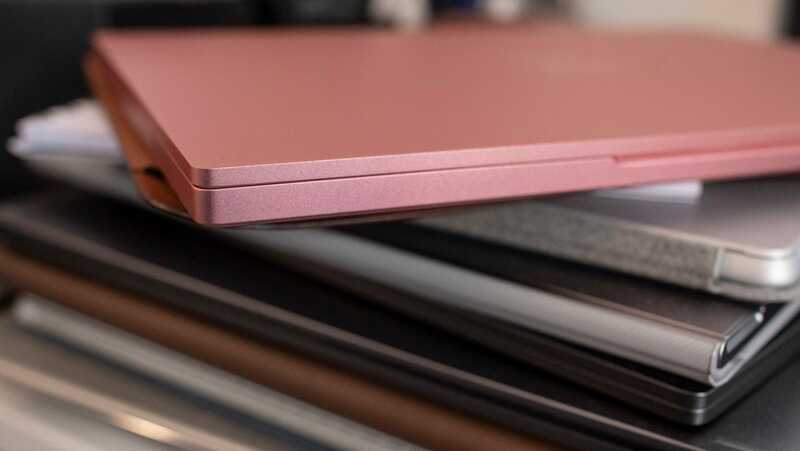 In a sea of silver and grey and black laptops, the pink quartz edition of the Razer Blade Stealth stands out. The speakers pumped out the music and the voices in the game with pleasing clarity, which was impressive because they had to overcome the din of the laptop’s fans. This thing runs loud when playing games. It also runs for a long time. In our battery rundown test, in which we stream YouTube video after setting the display’s brightness to 200 nits, the Stealth lasted 10 hours and 11 minutes. That’s just above average for the processor and display type, but impressive for a “gaming” laptop, with most of them typically crapping out well below 8 hours. The Razer Blade Stealth is a proper laptop for all occasions, and in many ways, it’s a much better laptop than the XPS 13, which is around £1,400 with a similar config to what we tested (minus the GPU and 8GB of RAM), and the Huawei Matebook Pro X. And instead of mixing in with a sea of silver laptops that all seem to look like a MacBook from afar, the Stealth stands out. You’re paying a premium for style, but sometimes that’s okay. The optional Nvidia MX150 shouldn’t be optional. Get it and enjoy gaming on a small laptop again. The keyboard is one of the best I’ve used on a laptop in ages, but its weirdly placed Shift key is annoying. Battery life is mighty respectable at 10 hours and 11 minutes, and the display gets bright enough for use in direct sunlight.